This week is a colour theme and it’s: ORANGE and PURPLE!! Kraftin Kimmie Stamps – Shake it up! We’ve also got a fun sketch for your inspiration for October! You don’t have to use it but if you need a little extra kickstart in your mojo, feel free to use it any time! And we are celebrating our NINTH BIRTHDAY this month at Kraftin’ Kimmie Stamps so here’s a SPECIAL for this weekend! ALL stamp sets in the Annie category at 40% OFF but only for the weekend and only while supplies last! We can’t wait to see what you all create! Be sure to submit your krafty design for your chance to WIN! You have until Friday, October 26th to enter this challenge! 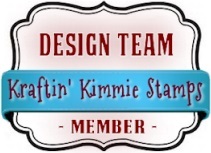 Keep in mind, all entries are welcome but you must use a Kraftin’ Kimmie Stamp in order to win. Stunning and thank you for including a video. I’m so happy you got here to my page. I hope my creativity will inspire you to do your own style and colorings. KKS challenge – Amazing women!!! April Krafty Peeks…Day THREE! It’s a Mystery PLUS a Challenge!